ACT, EBU and egta release a special TV spot every year to illustrate the strengths of TV - the medium that is watched and loved by billions of people around the world. Don't miss the diverse video clips we've produced during the previous editions of World Television Day and have a look at the overview below. Eager for more? Be sure to visit our YouTube channel and discover how dozens of broadcasters all over the world have adapted the video clip for their markets, ranging from countries as Finland or France to Canada or even China. Facts & figures about television? Visit the Global TV Group's Knowledge centre and discover interesting insights on topics such as TV investments, advertising effectiveness/ROI, viewing habits, media consumption, trust and much more. Global topic: TV as the source of quality content that informs, educates, inspires and brings people together. Global topic: In TV we trust. Global topic: What is TV? Television has impressively broken its historical linear chains, its one-way signal and its living-room constraints. TV is on all screens: it now means “Total Vision” or “Total Video”. Broadcasters play an indispensable role in the functioning of democracies and contribute to the cohesion of society. They drive investment in the production of high quality original European TV content. From news and documentaries through to drama, children’s programming and family entertainment, our goal is to produce ground breaking content to push the boundaries of creativity, originality and the very best entertainment has to offer. Despite the many choices consumers now have television remains the dominant medium with more and more of us watching across all platforms. Global figures clearily show the immense popularity of TV. Global topic: World TV Day celebrates TV’s ‘best moments’. Global topic: The capacity of television to engage all audiences. Television helps bring the world to people’s lives and living rooms. Through quality programming, TV sheds light on global issues and opens windows of understanding on the struggles and hopes of communities and families everywhere. 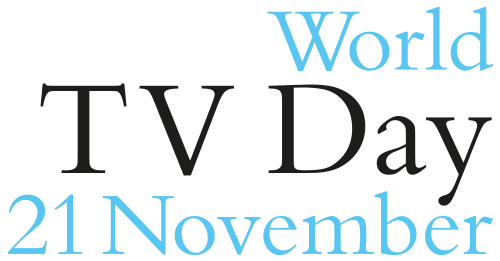 In 2012, for the first time, European trade associations took the opportunity of World Television Day, declared by the United Nations in 1996, to reflect on the values of television as a medium and highlight the role of TV in communicating on key transnational issues, its relevance to the world economy and its contribution to social and cultural development through testimonials and first-hand accounts on a dedicated website.